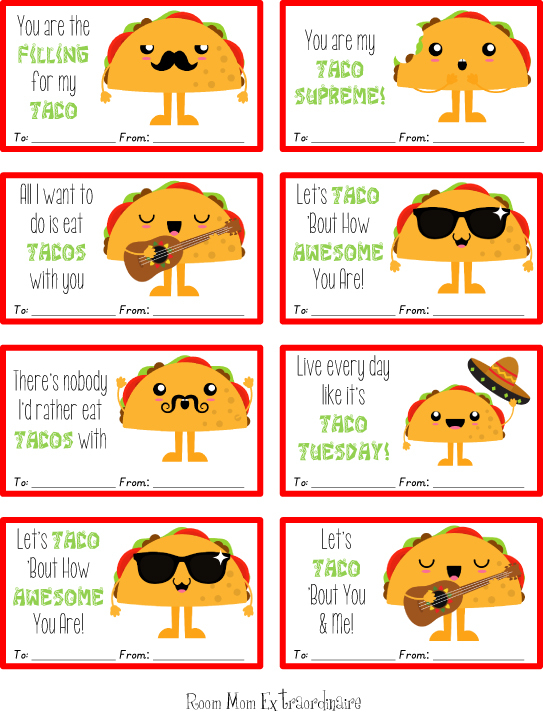 My taco-obsessed son wanted Taco Valentines to hand out to his friends! You can download them HERE. If you would like to purchase the clip art I used to make these, you can find it HERE. Go spread taco joy! 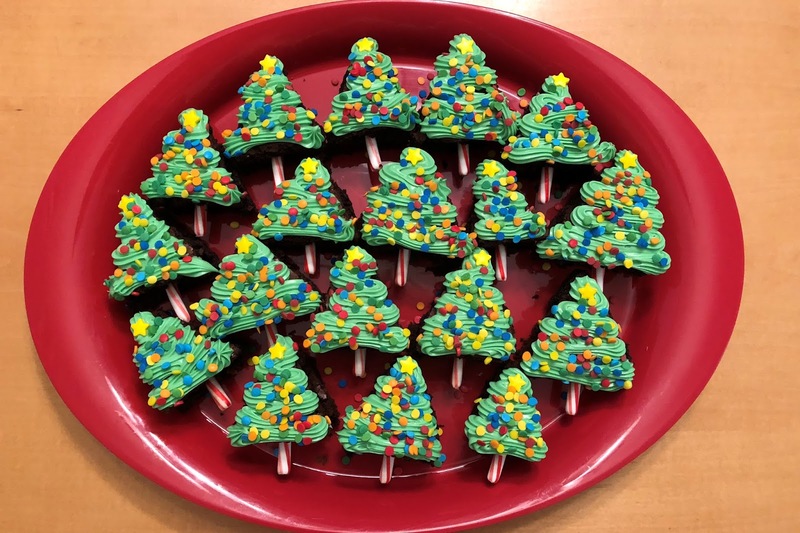 These Christmas tree brownies were fun and easy to make for our 4th grade Christmas party! I made a pan of brownies (I always make boxed brownies and they are always a hit - the trick is to not overcook them!) Once the brownies were fully cooled, I used the technique from this PIN to cut the brownies into triangles. Then, I broke the hook off of small candy canes and inserted the remaining straight peppermint stick into the bottom of the brownie. I used a frosting bag with star tip to pipe on the green frosting and added sprinkles and a yellow candy star! So cute! 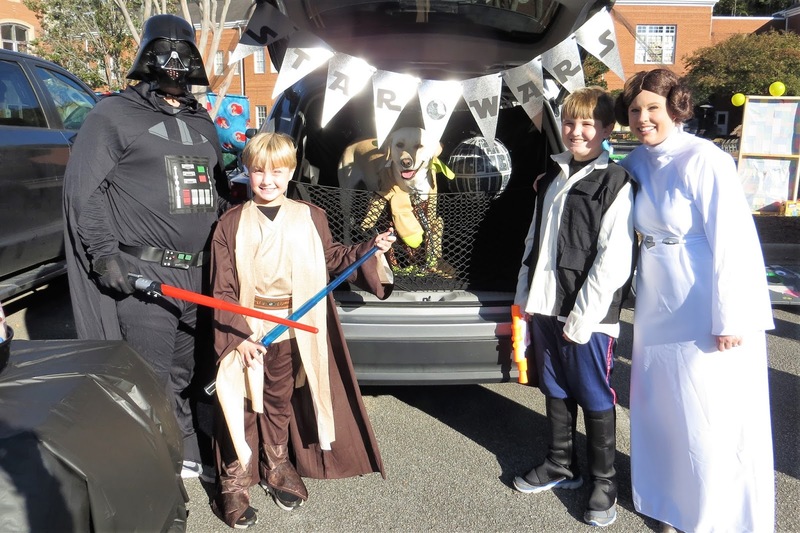 Our church does a Trunk or Treat event for the community every year. We decided to participate as a family this year. I hoped it would be something fun for us to do together since my kids are getting older and less "into" Halloween (well, at least the teenager!) It was a blast and we are already talking about / negotiating what theme we will do next year! For this year, we decided on the classic, never-fails Star Wars theme. I focused less on the trunk itself and more on our costumes and the photo booth. Here's the whole group! My husband was Darth Vader, I was Princess Leia, my 13 year old was Hans Solo, my 10 year old was Luke Skywalker, and our dog was Yoda! Everyone loved seeing the dog dressed up! For the trunk, I covered the back in black using black plastic tablecloths and black felt. I added the Death Star inflatable hung from the ceiling (Amazon). I made a Star Wars banner with silver foil cardstock. But, the center of attention was Yoda! My next favorite thing (besides the costumes) was the photo booth! I borrowed the PVC backdrop frame from a friend and added starry plastic tablecloths as the backdrop. Then I had tons of quotes and masks for people to use and take their own Star Wars pictures. I purchased the masks HERE. I made the quotes and you can download them HERE. For photo booth props, I usually print them on white card stock, laminate them, and hot glue a wooden skewer to the back. This was a big hit and created lots of cute photo opportunities! 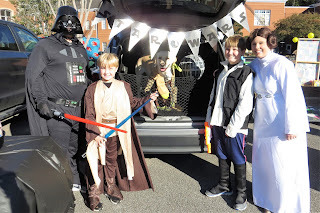 Trunk or Treat was so much fun! I can't wait to do it again next year! I wanted a cute way to mark my herbs but didn't want to spend a lot of time or money on the markers! So, I took a plain wooden popsicle stick, stamped on the letters, and wrote in the groves with a black pen. I already owned the stamps from a previous project (see HERE), so creating the markers was definitely cheap and easy! Our local Farmer's Market generously allowed our church Food Pantry to collect produce donations all summer! I wanted to say "Thank You!" to the farmers who donated to us and to the proprietors of the market who enabled us to be there! I made some mini banana bread loaves and let them cool completely. Then I wrapped them in plastic wrap and aluminum foil to keep them fresh. I wrapped all of that in a cute napkin (Pioneer Woman at Walmart) and tied the ends with jute twine. Next, I added burlap ribbon, tulle, and a gift tag. The gift tags can be downloaded HERE. I also made matching clothespins as an extra "happy"! (instructions for those can be found HERE.) I gave these to all the farmers and vendors who had been so kind to us! For the proprietors, I made a small gift basket with the wrapped banana bread, candle, coasters, and other local or homemade items! Being at the farmer's market was a great experience and we are so thankful for the fresh produce we were able to provide to the needy in our community!